Remember the days when employees, and worst, clients, had to sit through the boring presentations using the AV of yesterday? Surprisingly, there are still many companies that use those methods. In today’s professionally prepared system the content presents impactful presentations, audio/video collaboration and more formatted in a way that delivers information so that people can comprehend. The AV for today’s meeting rooms is more than just pieces of equipment. The technology includes not only the AV and IT components but also things such as lighting, acoustics and other environmental conditions that together make communications and collaboration more effective. 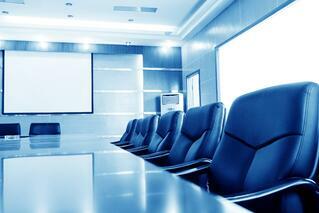 What are some of the things to consider in having the Exceptional corporate AV system? Various studies over the years have shown that……..
79% Percentage of meeting attendees interviewed said a typical meeting would be more effective if information from more than one person could be viewed at the same time. 90% Percentage of the participants interviewed said that it would be useful if they could display content on-screen from their smartphones or other device during a meeting. 80% Percentage of non-verbal clues that exist in communications. When video is used in a presentation, participants are more likely to stay focused. If your answer is no, you should contact a Certified AV Systems Designer/Integrator to assist you in bringing them into conformance.